Coming home can be a cause of delight and distress, of comfort and conflict. These dynamics are perhaps especially acute when the homecoming follows imprisonment. The penal system changes what home means and what it is – by taking people away or by returning them, and by making home a site of punishment, as in the case of some community sentences. This week punishment came home with me in a very unusual way. As a criminologist and sociologist who studies punishment, thinking about it is very much a part of my everyday life and experience – but, perhaps like most people who are not personally affected by criminal justice, these are not issues that pervade my family life and the personal space we share. Last Thursday night was different. I brought about 15 family and friends together to eat pizza and pasta, to drink wine and beer and fizzy drinks, and to listen to and discuss ‘Distant Voices’. ‘Distant Voices – Coming Home’ (to give its full title) is a research project that has developed song-writing in and around criminal justice in Scotland as an innovative way of exploring and enhancing rehabilitation and justice. It is a partnership between the charity Vox Liminis and the Scottish Centre for Crime and Justice Research (SCCJR) at the University of Glasgow where I work, but it also extends to the University of West of Scotland and the University of Edinburgh, spanning the disciplines of community development, criminology, musicology, politics and sociology. With funding from by the Economic and Social Research Council and the Arts and Humanities Research Council (and with match funding from arts funder Creative Scotland and from the Scottish Prison Service), our simple, if ambitious, aim is to change the conversation about punishment and reintegration. Our debut album, Not Known at this Address, was released in May. The co-writers on the album include people in prison and people who work in or study criminal justice. Many were writing songs for the first time, in collaboration with a stellar cast of Scottish songwriting talent. Brought together by the project’s Creative Lead Louis Abbott (Admiral Fallow), the record features Emma Pollock, C Duncan, Rachel Sermanni, Kris Drever, Pronto Mama, Bdy_Prts, Fiskur, Donna Maciocia and Admiral Fallow themselves. And since the song-writing explores coming home from the perspectives of people whose homes crime and punishment have disrupted, we think it makes sense to share the songs as close to home as possible. 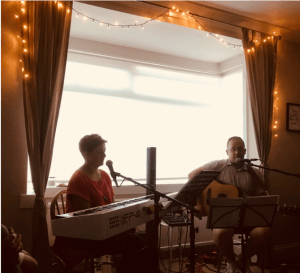 The ‘house gig’ in my home on Thursday was one of 8 in this phase of the project – all taking place in the homes of people somehow engaged with the project, but reaching out to others through our social networks. We’ve also shared the songs at much larger gigs in mainstream venues and festivals and through the media and the internet. I think the house gigs are special, however. They provoke and permit the kinds of dialogue about crime and justice that is often so hard to generate. When the musicians talk about the song-writing process, and the stories and people who co-wrote the songs, they bring those stories and people alive in the audience’s consciousness. They make the human characters of crime and punishment audible. Punishment ceases to be anonymous. Very few of the songs have any obvious message – political or otherwise. Neither does the project want to sell any particular position on penal reform. We all have our own views about that. Sharing songs about love and loss, regrets and remembrance, change and continuity, and perhaps most powerfully about hope and despair, doesn’t tell us what to do about crime and punishment. But it does remind us what and who is at stake, and why we should care about what happens to the people punished in our name and who, some day, are coming home. You don’t need to host or attend a house gig to join this conversation. Use this website to listen to the songs and get in touch. Tell us what you think and what you feel about what you hear. We need to talk about punishment, and we need to talk about life after punishment.